The Inspector General of Police (IGP), Mr. David Asante-Apeatu appealed to the general public to desist from vandalising Police Stations for the forcible release of detained relatives and friends. He stated that the Police Service do not exercise its power of arrest irresponsibly, saying that was professionally done with a cause, in situations, where either an individual or group of people had committed crime. The Police then would investigate the matter, prefer charges and proceed to any Court of competent jurisdiction for the prosecution of the culprit(s), the IGP explained. IGP Asante-Apeatu made the appeal when he was addressed a durbar for the inauguration of a Police Station and a two semi-detached apartments built by a philanthropist for the people of the Aworowa community in the Techiman North District of Brong-Ahafo Region. The durbar, organised by the chiefs and people of Aworowa in collaboration with the Techiman Divisional Police Command was part of the IGP's three-day working visit to Brong-Ahafo. The entire project valued at GH¢ 90, 000,00 are made up of the two semi-detached apartments, the Police Station consisting of two offices, a cell and place of convenience. In addition, a complaint desk, furniture and a motorbike to facilitate immediate commencement of duty by Police personnel to be posted to the place were provided by the philanthropist. IGP Asante-Apeatu advised members of the general public to refrain from taking the law into their own hands since no investor would like to invest in an area where lawlessness was prevalent. He urged the people to assist the Police with the provision of necessary information that could lead to the arrest of criminals in their communities. 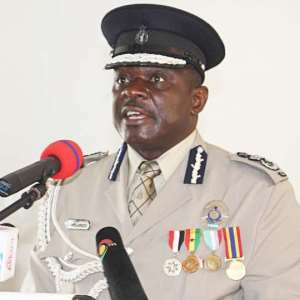 IGP Asante-Apeatu entreated Ghanaians to be law-abiding citizens to make the work of the Police easy and enable them to fight crime in a more professional way. He emphasised that the law was not respecter of persons and anyone who acted contrary to it would be arrested and dealt with accordingly. The philanthropist, Nana Ofosu Gyeabour recounted that he was distressed when the Police personnel were withdrawn from the place in 2016 due to the closure of the Police Station, as a result of their ejection by the landlord. Nana Gyeabour, who is the Baamuhene of Techiman traditional area said he could simply not sit unconcerned when the Police could not operate in the community. The philanthropist said with the support of some individuals, he gathered resources to construct the facilities, so that the Police could operate for the people to enjoy the needed protection to peacefully go about their daily activities. Nana Yeboah Kokwa ll, the Chief of Aworowa, on behalf of the people and the Police expressed appreciation to the philanthropist and stressed the need for the Police to maintain the building properly for the benefit of even generation yet unborn.